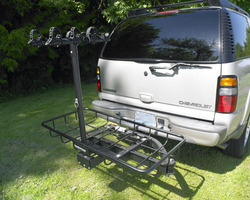 StowAway2 Cargo Carriers is proud to announce the release of its new Rainier Bike Rack. The Rainier is a hitch mounted bike rack that lets you have it all: easy access to the rear of your vehicle, a cargo rack for your extra gear, and premium security features. Portland, OR (PRWEB) September 14, 2008 -- StowAway2 Cargo Carriers is proud to announce the release of its new Rainier Bike Rack. "The Rainier incorporates everything that our customers have been telling us they want in a full-function bike rack - not just a place for their bikes but also room for their bike gear," said StowAway2 President Jim Stewart. "The Rainier lets you have it all: easy access to the rear of your vehicle, a place for your extra gear, and the security features that you expect from a premium bike rack." The Rainier mounts on all Class III/IV 2The Rainier stands above the pack thanks to its versatility. StowAway2's patented and rugged swingaway frame enables the Rainier to swing out for clear access to the rear of your vehicle -- even when the bike rack and cargo basket are fully loaded. The frame pivots a full 180 degrees for total clearance on both liftgates and van doors. Best of all, the racks are interchangeable: the bike post can be removed for those trips where the bikes don't come along and the cargo rack can be removed if you only need to bring the bikes. Like its name suggests, the Rainier offers ample room for all your bike helmets, tools and other gear. Its cargo rack measures 53" x 25" x 5" and it can carry up to 200 pounds (bikes and gear). The Rainier mounts on all Class III/IV 2" hitch receivers, making it the perfect addition for most SUVs, minivans, trucks and RVs. The Rainier wouldn't be complete without all the extra touches that you expect from a high-end bike rack. "We've added a keyed-alike security cable and hitch lock to prevent theft and included our popular Hitch-Coupling Tightener to eliminate hitch wobble," said Stewart. "With these additions, we think the Rainier is the most functional, versatile and secure bike rack available today." StowAway2 has been the market leader for Hitch-Mounted Carriers since 1999. 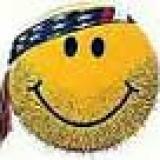 To view the entire StowAway2 catalogue and for ordering information, please visit StowAway2.com.